Bible verse will be attached! There may have been a few groans when Pat Neshek shared May advice for autograph collectors. Don’t forget the SASE? Some veteran hobbyists snorted. Who wouldn’t enclose a self-addressed, stamped envelope? Where was the advanced, top-secret formula for guaranteed autographs? I decided to cross-check Pat’s concern. Could it be? 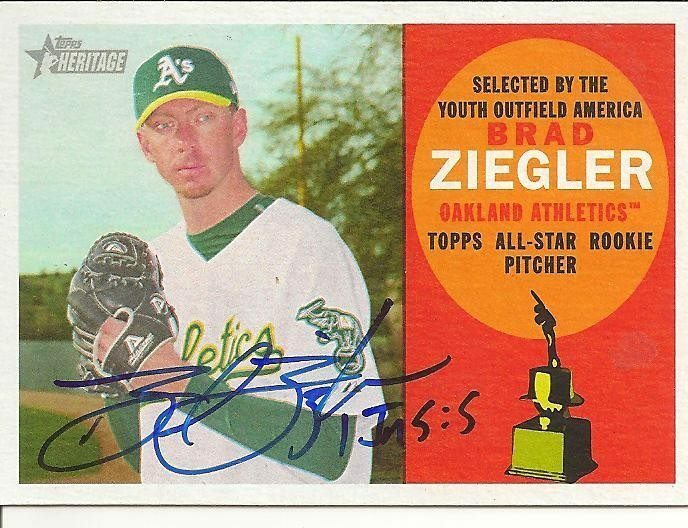 I sought out Arizona Diamondbacks pitcher Brad Ziegler. How many fan letter autograph requests does he get NOT including a SASE? I told him that veteran collectors hope to get the word spread, to reduce the number to ZERO. Thank you 🙂 5%. Most have SASE. The ones that don’t, I keep the cards. Five percent is five percent too many. Pat loves the hobby himself so he tries to be as accessible as he can be. He said about 1 out of every 10 requests don’t have a SASE. Come to think of it…one out of 10 is one too many. I salute everyone who’s learned the rules of TTM collecting. To everyone who shares those rules, I offer an extra cheer. Coming Wednesday: Youtube, the next stop for autograph enlightenment!